I’m working on a project about the experience of chronic pain, and I’m aiming for it to be not literary but still thoughtful and mutual-helpy, a kind of daily reader for chronic pain folks. I’ll be posting excerpts here occasionally to help demonstrate an interest as I shop a proposal around. 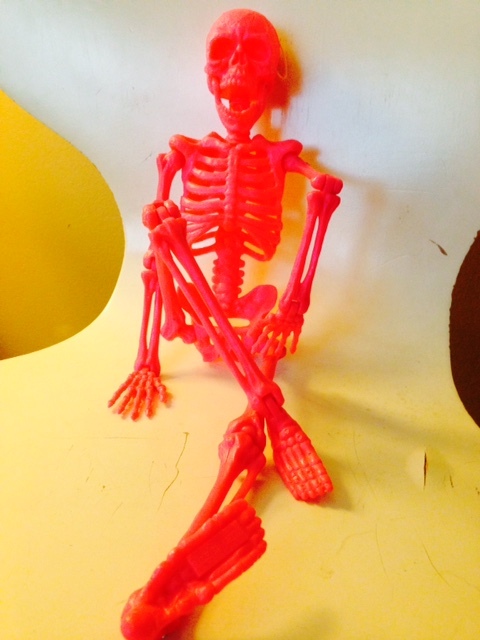 Pink skeleton is still pretty sassy! The standard world, the majority, seems to operate on a daily basis without some form of excruciating or annoying physical pain. I can “pass” as normal in that world, which is a place I used to live all the time. But now I live somewhere different, and here, my body normally has pain. Pain—the signal that something is amiss, wrong, or bad—is okay here. I don’t mean that I like it. I mean that pain is nothing surprising here. The pain experience itself is that red flashing bulb in the background of my day: danger, danger, danger. Especially when I’m tired or run-down, and especially when my pain overwhelms me, I often take on the world’s negative judgments of pain as well as the pain itself. If I am in pain, I am bad, wrong, amiss. Here I am on the couch, on a day I had to call in sick to a meeting. I am waiting for a call from one doctor and I know I have to go to another doctor this afternoon. And all throughout my body, the danger signs and red lights are flashing: abnormal, amiss, wrong. I am living in that red glow, but after five years of it, I have managed to make a transition in how I see it. I first went through a solid year of panic at how horrified I was to be in pain all the time. I had pain, and then I had mental pain about the pain. Gradually, over the following four years, I began to understand that that red flashing light of pain had to become the new normal for me. I have an incurable disease. That doesn’t mean that I as a person am abnormal, dangerous, or amiss. I still go into that panic rejection of pain almost every day, but most of the time I can separate the two strands of discomfort from each other. I want to hate the pain without hating my life for having pain in it. I have to constantly remind myself that the pain is not a sign of failure and that I am no longer living by the standards of normal bodies. For me, this pain is perfectly unsurprising. Some days are down days. I am well within what is normal for my body. For me, this is no failure. This is how I live, and one of my goals is to get a real sense of my body’s range rather than judging it by what other people say their bodies do and feel like. If I can remember that, I have one less thing to pile on myself as I’m laying here, trying in a half-hearted way to respond to work emails. I’m getting stuff done, and then I’m resting, by the light of this red flashing light, and although it’s a little glaring sometimes, it is my life. This is my normal, and my body is well within the range of human experiences. I am not abnormal. I am on the bell curve and part of the human community. Some of us have pain and we are still people, exploring the full range of what it means to be alive. I think one of the things I constantly battle in my own ‘pained brain’ is that normally pain is a signal for you to STOP doing what is causing the pain. However in fibromyalgia, the signals to the brain are overactive, confused or both. Meaning that I’m not doing damage to my body by continuing to move, it is just that my brain is receiving very real, but phantom signals of pain. My body feels pain, my brain says, ‘stop doing that, it hurts’, and I have to then override that instinct and try to move anyway and ignore it. I remember in my mom’s bout with RA, she would ‘do her exercises’ even when it hurt because it hurt more to not do them. What I hate about my pain is it robbed me of the very active life I knew just 4 years or so ago. I did all the right things the past 35 years. Lifted weights, biked, climbed mountains, skied, played all sports. Made sure I did physical activity at least 5 days a week. This was my life for decades. A life I shared with my wife to a large degree. We learned to ski when we were 40. We biked, took long walks. Now this joint disease has turned a formerly active 56 year old into a couch potato watching others do and being envious of their ability to do. I have not accepted this new normal as I bounce from doctor to doctor and surgery after surgery searching for the answer that will turn off the bone spurs and the arthritis. I refuse to accept it but know the day I just had, will be the best day of the rest of my life. Well said, Sonya. Accepting that pain is – and always will be – a defining part of my life isn’t easy… I’m not totally there yet. But I felt closer to that acceptance a couple of weeks ago when my hubby and I were on vacation (wwwaaaaay far south of Ohio), and the sun was blazing hot. I sat in a deck chair by the pool; the shade from the umbrella didn’t cover my legs. My knees and ankles still screamed at me, but the sun felt so good, and the little mantra “bake the ache” kept pinging through my mind; it made me smile. I felt like I’d won a little something, because the the ache couldn’t quite keep pace with the bake. It was a great moment. (I’m sure the diet coke and rum had no influence at all, lol).